Sony's new Master Series A9F and Z9F TVs with HDMI eARC and Netflix video optimization, have a starting price of $4,500. Sony's much-ballyhooed Bravia Master Series OLED and LCD displays, to be demonstrated at CEDIA Expo 2018 next week, now have starting prices and ship dates. Announced in July, the new Android-powered TVs include the A9F OLED series and Z9F LCDs. They feature several "firsts" for Sony and the industry, including HDMI eARC, the technology that enables pass-through of high-resolution soundtracks over a single HDMI cable. These displays are the first to feature a Netflix Calibrated Mode that optimizes video quality for Netflix content. They also offer three different HDR options -- HDR 10, Hybrid Log Gamma and Dolby Vision. 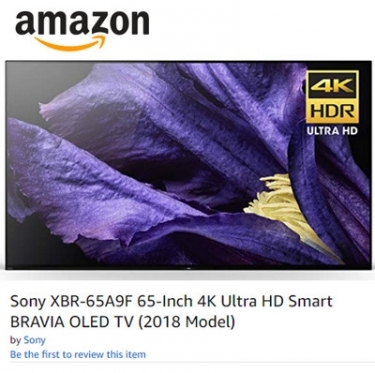 Sony says these models are "available for pre-sale now" at Best Buy and Amazon (A9F and Z9F) but the links provided do not show pricing, nor a way to pre-order the TVs at this time. Follow CE Pro's coverage of CEDIA Expo 2018.